When I cook beef, I like to use a wet marinade paired with a matching glaze. 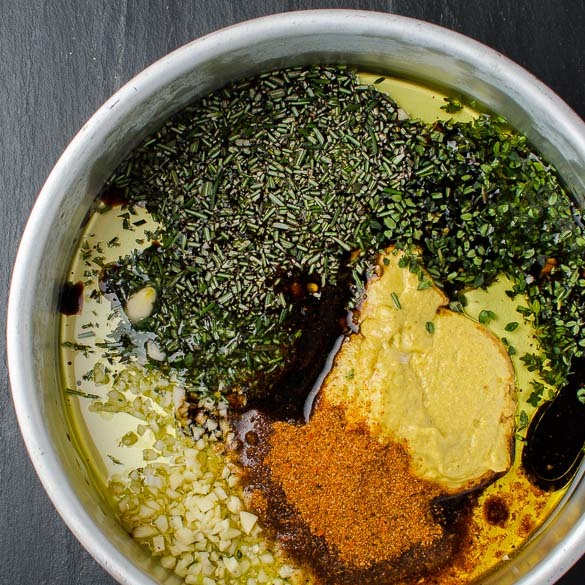 I often think of the glaze first before the marinade. When I noticed my of half bottle of Jack Daniels beside my bottle of clover honey on my kitchen counter top, I thought, "Hmmm . . . would a honey whiskey glaze work well with beef?" There was only one way to find out so I tried out this combination. 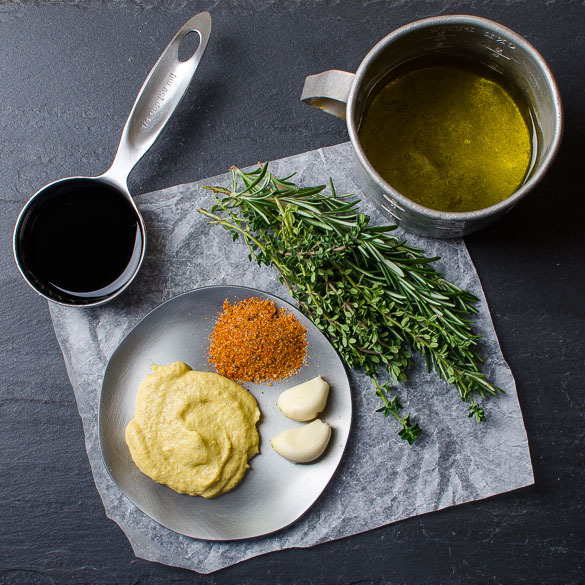 I think you'll like this super delicious and easy recipe which pairs my oil, mustard, vinegar and garlic marinade which has been infused with herbs with a whiskey based sweet glaze. 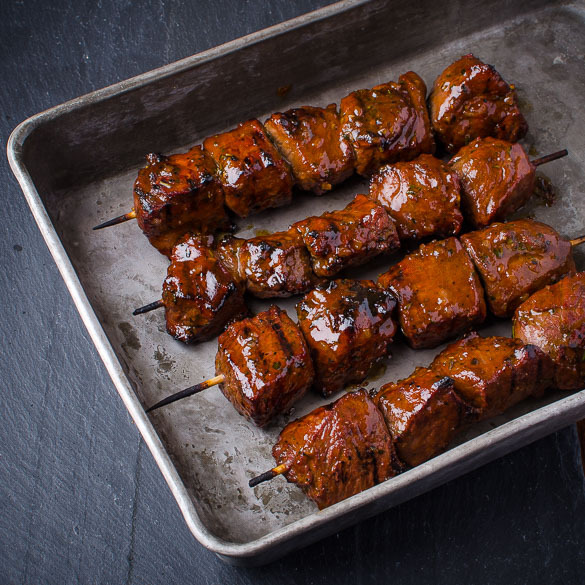 The beef is cooked on a grill (I chose to do kebabs this time) and then lovingly slathered with a honey whiskey barbecue sauce. 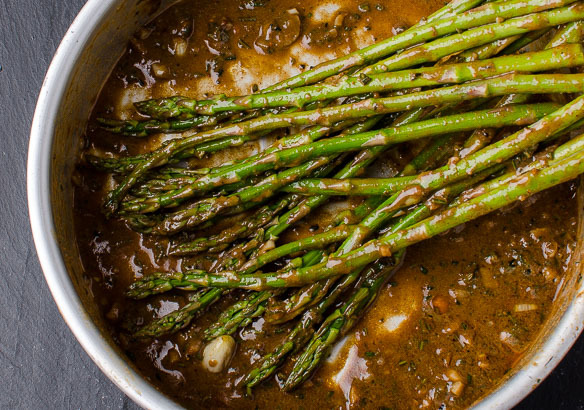 To save time on a busy weekday, I used a store-bought sauce and flambéed the whiskey first leaving behind a subtle whiskey nuance in the sauce. There's enough whiskey to be tasted but not enough to overpower the beef. I used my SYD Beef Rub which won 1st Place USA in the 2010 and 2011 KCBS National Beef contests. 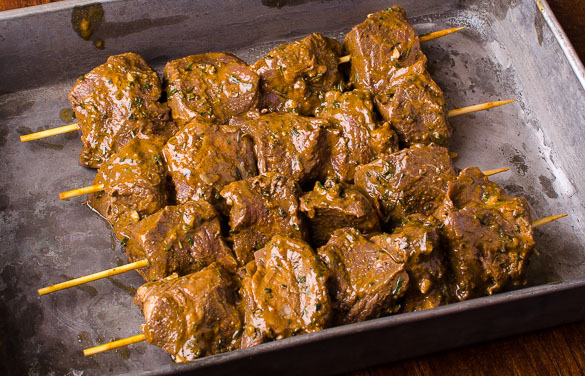 These are 8 oz skewers so 2 lbs is good for 4 persons. 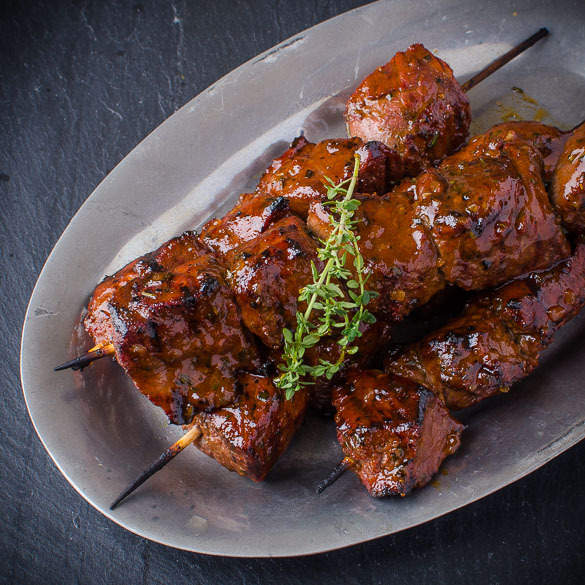 If you prefer an appetizer kebab, use 6 oz of meat. Prepare marinade and place in gallon zip bag. 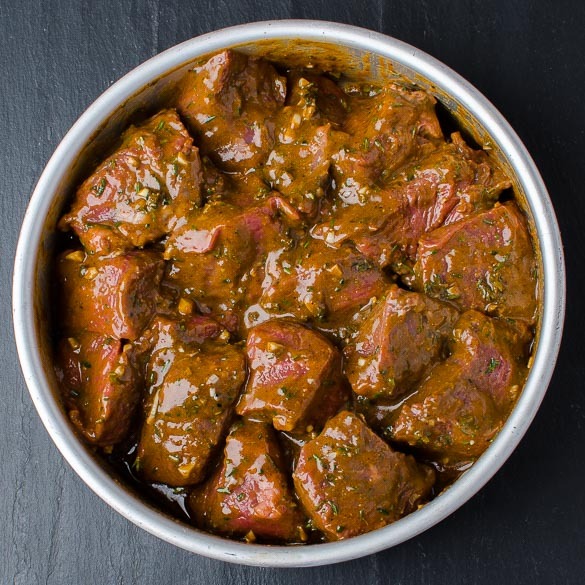 Add beef cubes and let marinate in fridge, 2 hours or overnight, turning occasionally. 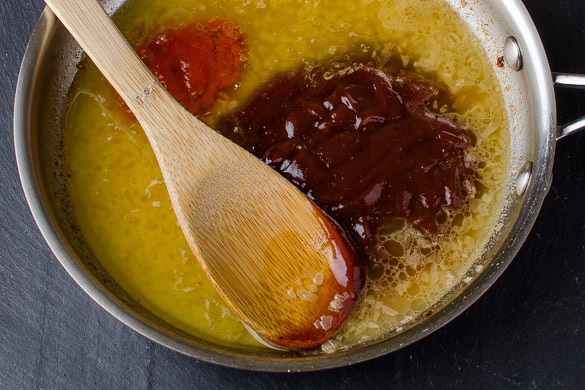 Prepare glaze by melting ½ stick butter in saucepan and adding two tablespoons finely chopped onion. Saute until translucent. Remove saucepan from fire and add ¼ cup of your favorite bourbon or whiskey. Return pan to fire and carefully tilt the saucepan to catch fire and flambe the alcohol off—flames will be about 1 to 1 ½ feet tall and diameter of pan, so don't lean over the pan (it will take about 20 seconds for it to finish burning off). 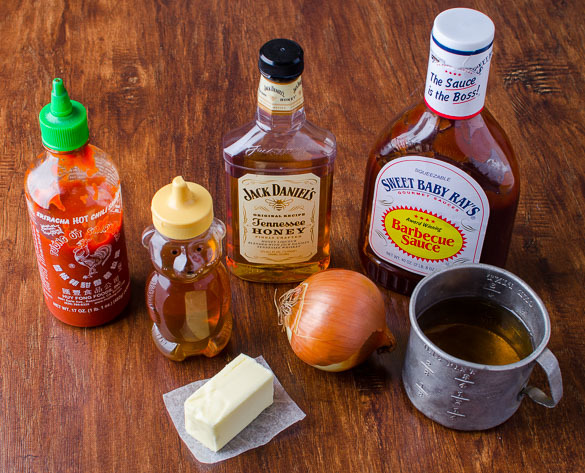 Add ¾ cup of your favorite BBQ sauce and 2 tablespoons honey and 1 tablespoon Sriracha taste. 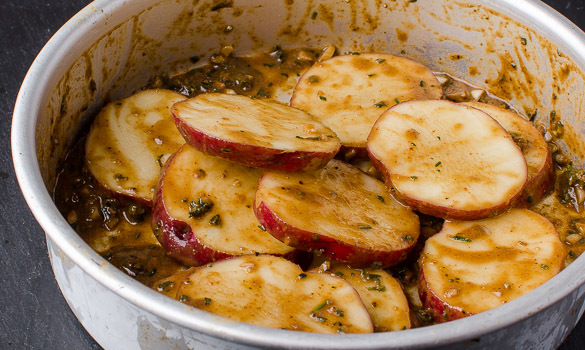 Add apple juice or water to thin the sauce so it's like runny gravy. Prepare grill with a hot and a cool zone. 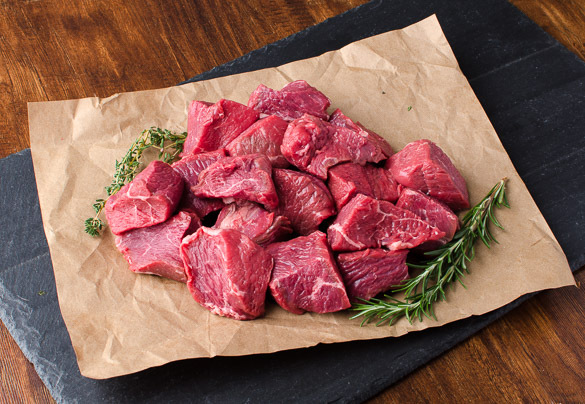 Drain beef cubes and discard marinade (or optionally reserve it to toss sliced red potatoes and asparagus in before grilling). 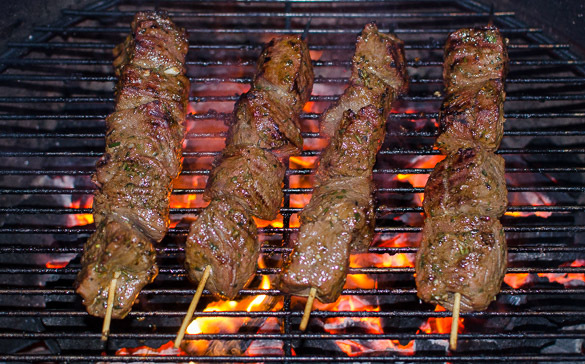 Thread beef onto six metal or soaked wooden skewers. 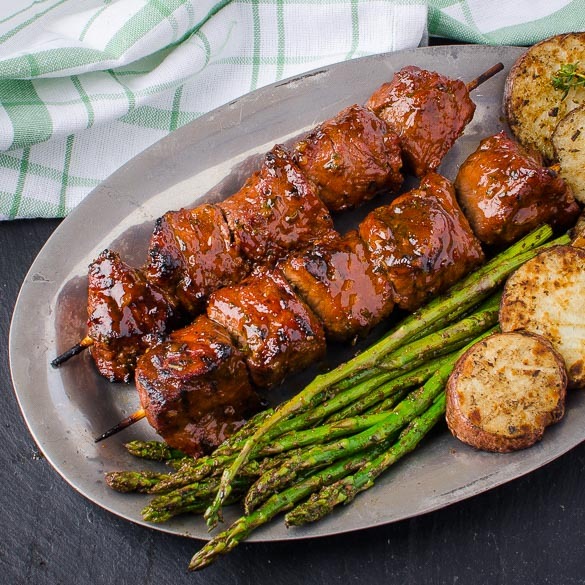 Since you're already firing up your grill, you can thinly slice some red potatoes with skin on and toss the potatoes with the beef marinade you drained. 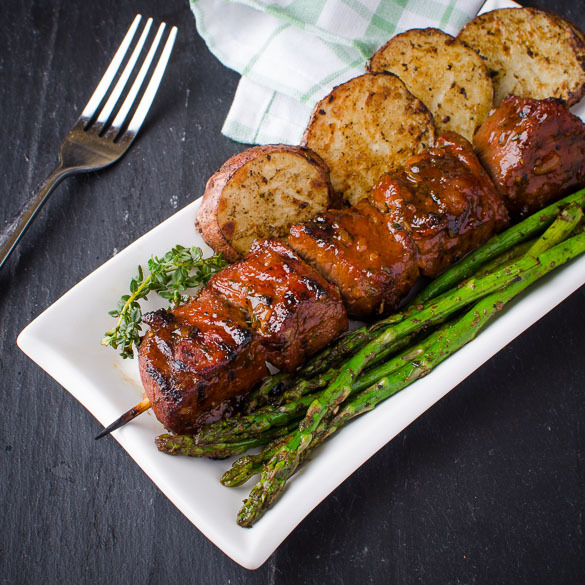 Grill your thinly sliced potatoes before you grill your beef skewers to you'll have a tasty side dish to go with the skewers. The same process works for asparagus or bell peppers you can grill to go with your beef.